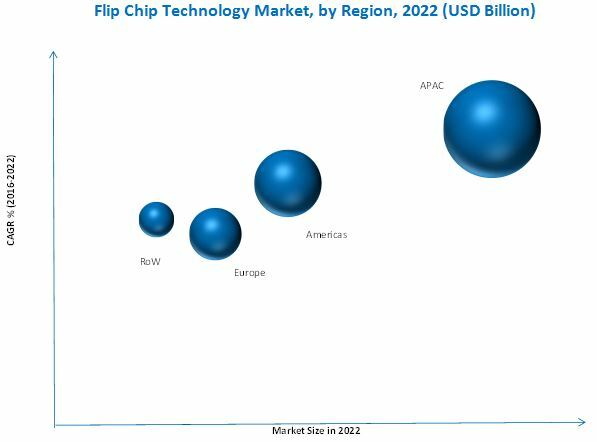 The flip chip technology market is expected to grow from USD 19.01 Billion in 2015 to USD 31.27 Billion by 2022, at a CAGR of 7.1% between 2016 and 2022. The report aims at estimating the size and future growth potential of the flip chip technology market across different segments on the basis of bumping process, packaging technology, packaging type, product, application, and region. Consumer electronics application is expected to be the fastest-growing segment in the flip chip technology market during the forecast period, followed by automotive application. This report provides valuable insights regarding ecosystem of this market such as product manufacturers and suppliers, OEMs, OSATs, system integrators, middleware and firmware providers, suppliers and distributors, This study answers several questions for stakeholders, primarily which market segments to focus on in the next six years for prioritizing efforts and investments. According to the MarketsandMarkets forecasts, the flip chip technology market is expected to grow from USD 19.01 Billion in 2015 to USD 31.27 Billion by 2022, at a CAGR of 7.1% between 2016 and 2022. The growth of flip chip technology market is mainly attributed to the increasing demand for miniaturization and high performance in electronic devices and strong penetration of the advanced packaging technology in the consumer electronics sector. There has been considerable reduction in the size of the die, with the introduction of flip chip packaging technology, thereby saving the silicon cost. Also the total package size can also be reduced using flip chip technology. The other benefits of flip chip technology include reduction in signal inductance, reduction in power inductance, and higher signal density. The scope of this report covers the flip chip technology market by bumping process, packaging technology, packaging type, product, application, and region. The copper pillar process is expected to hold the largest market share of the global market, and it is also expected to be the fastest-growing technology to manufacture chips in various applications during the forecast period. The maximum growth of Cu pillars is driven by the need of finer pitches, higher I/O counts, lithography nodes below 28nm, emergence of 2.5D/3D packaging, and increased current density, and thermal dissipation needs. On the basis of packaging, the market is segmented into FC BGA, FC PGA, FC LGA, FC QFN, FC SiP, and FC CSP. FC LGA led the market in 2015.The market for FC CSP is expected to grow at the highest CAGR during the forecast period. All the CPUs including the application processors utilize flip chip land grid array package type for mounting the ICs on the substrate or external carrier. The market in APAC is estimated to grow rapidly between 2016 and 2022. Majorly, the demand for flip chip technology is coming from the consumer electronics sector and particularly from smartphones and tablets. As a result, the presence of major companies in this sector such as Samsung (South Korea), Sony (Japan), and many other are driving the flip chip technology market in the APAC region. Additionally, this region is home to three of the major players in flip chip market ASE group (Taiwan), TSMC (Taiwan), and Samsung (South Korea). Major players in this market are Samsung (South Korea), Intel (U.S.), GlobalFoundries (U.S.), UMC (Taiwan), ASE, Inc. (Taiwan), Amkor Technology (U.S.), STATS ChipPAC (Singapore), Powertech Technology (Taiwan), and STMicroelectronics (Switzerland) among others. These players adopt various strategies such as partnerships, agreements, mergers and acquisitions, and new product developments to achieve growth in the global flip chip technology market. Amkor Technology, which is a market leader in the flip chip technology, has entered into a partnership with Electronics Industry Citizenship Coalition (EICC) to design and develop several package layouts and technologies, including the Package-on-Package (‘PoP’) platform with Through-Mold Via (‘TMV’) technology, fusion quad, flip chip ball grid array (FCBGA), multi-chip modules (MCM) with a silicon interposer placed between the module chips and substrate, copper pillar bumping, and fine pitch copper pillar flip chip packaging technologies. The company has merged with Toshiba’s Malaysian Semiconductor Packaging (Japan) to develop a new research technology in advance semiconductor packaging. 14.8 Siliconware Precision Industries Co., Ltd.